I wrote a blog post giving PokerStars a design advice back in September (read the post here). And today when I played at PokerStars I noticed that they had implemented the solution I wrote about. My design advice back in September was “A much better solution would be to let the player just click on the text in the chat window or the “banner” to open up the tournament’s lobby where I can register.” and that is how it works today! 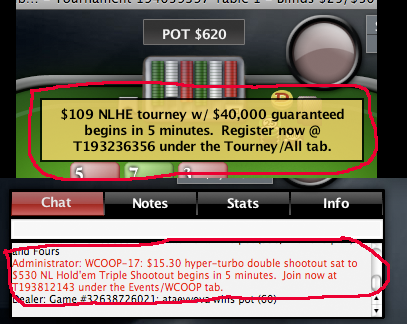 Good job PokerStars!